I wonder why he doesn't go after HRC who actually paid for dirt on Pres Trump. Seems to me to be a BIG double standard. It's okay for the democrats to do something but not the Republicans. I'm still waiting for all the proof of collusion he said he had. He has been lying to the American people for years. He needs to resign. Another erroneous meme. When will these people learn? Everything Schiff mentions in there is either totally legal or was information available in the public domain (IE not handed off in clandestine fashion as insinuated). Adam Schiff talking about ethics and morality is a joke. He won't even support his own 2013 FISA Oversight bill since Trump is in office now and it would expose the corrupt abuse of current FISA laws by the DNC, the FBI and the Justice Dept all in an attempt to ensnare Trump. He's as corrupt as they come. Another erroneous meme. When will these people learn? They will never learn. BTW, Schiff was taped talking to a Russian trying to get dirt on Pres Trump. It's their double standard. It's okay when he colluded with the Russians and okay when HRC colluded with Ukraine and the Russians but not okay if anybody else does it. 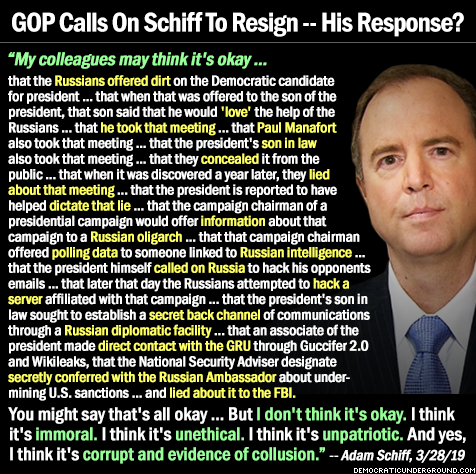 Adam Schiff talking about ethics and morality is a joke. Gee wiz don't you sound just like Soup. Ethics and morality are something our current dummy in chief knows nothing about. This would also include his children and other offspring he may have that we do not know about. Poor zandt. Early indoctrination on full display. Kid never had a chance. I'm much more dashing and debonair. And all around bon vivant.